In the early 1960s in a small rural community of Winner, an idea came to the Veterans of Foreign Wars Post #4674 Commander. 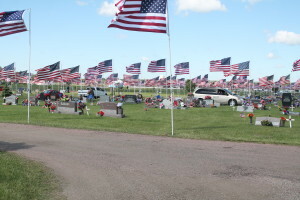 His idea was to line the “streets” of the Winner Cemetery with flags on Memorial Day. His idea became a reality when 16 casket flags flew on the streets of the cemetery. The reason 16 flags were flown was to honor the memory of those from the community who had paid the ultimate price in combat. For an unknown reason, the number was much higher than 16, but that was all they were aware of at that time. This number of flags continued to be flown for several years on Memorial Day. In the 1990s the three veteran’s organizations in town met and decided they would form an organization called “The Avenue of Flags Foundation”. Members from the American Legion, Veterans of Foreign Wars and Disabled American Veterans, all from the Winner community, met and laid out the bylaws and purpose of the organization. About 430 flags were being flown by 1996. The need for more man power was readily identified, followed by more flag poles, wagons to hold the poles, cement holes, bigger cedar lined chests to hold the flags and funds to purchase the needed items. The call went out to the community along with the needs list. Many hours were donated during the weeks before Memorial Day to perform those tasks that make up such a huge project. The people responded; men, women and children all came at 5 am to help put the flags up and again a 5 pm to take them down. The sight is breath-taking with the flags flying so majestically in the morning breeze. Each flag pole has the name of a veteran on a plaque. By 1999, a metal building was built to house the materials used for Memorial Day. This year, over 850 flags will fly on Memorial Day at the Winner cemetery in a visual honor of those who bravely served. The cemetery, which is kept well-manicured by the city workers throughout the year, is the final resting place for so many who have served with pride and have now gone to their heavenly home. See these beautiful flags wave with pride as you join fellow community members in remembering these men and women, at the annual Memorial Day service which begins at 11 a.m. on Monday, May 29.